Well, the storm is nearly here, and it seems that most forecast models are in agreement for this upcoming storm. Since yesterday, there has been a trend toward a faster phase between the two lows tomorrow afternoon. As a result, I am bumping up snow totals for areas north of Philadelphia. A general 3-6 inches should fall in the city and its immediate suburbs. 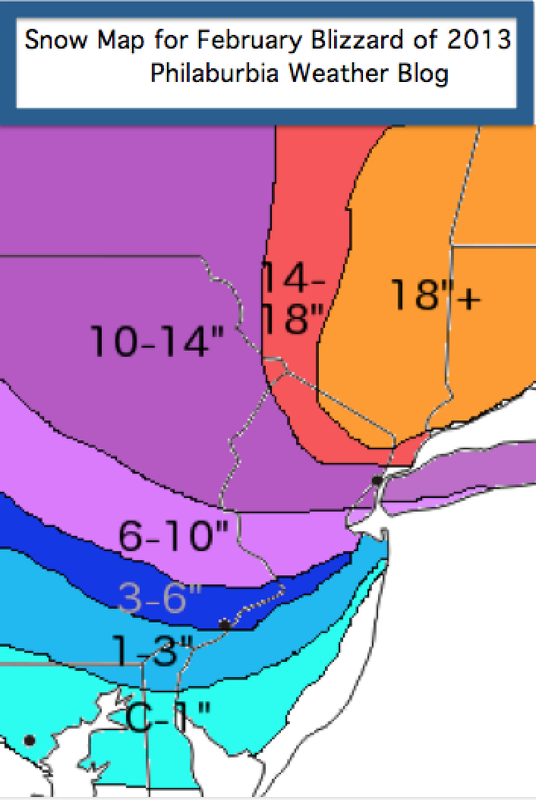 Central and Upper Bucks, Mercer, and Hunterdon will get 6-10 inches. In New York City, blizzard conditions are likely with totals reaching over a foot. Up in Connecticut and Massachusetts, final snow totals could come close to 30 inches! 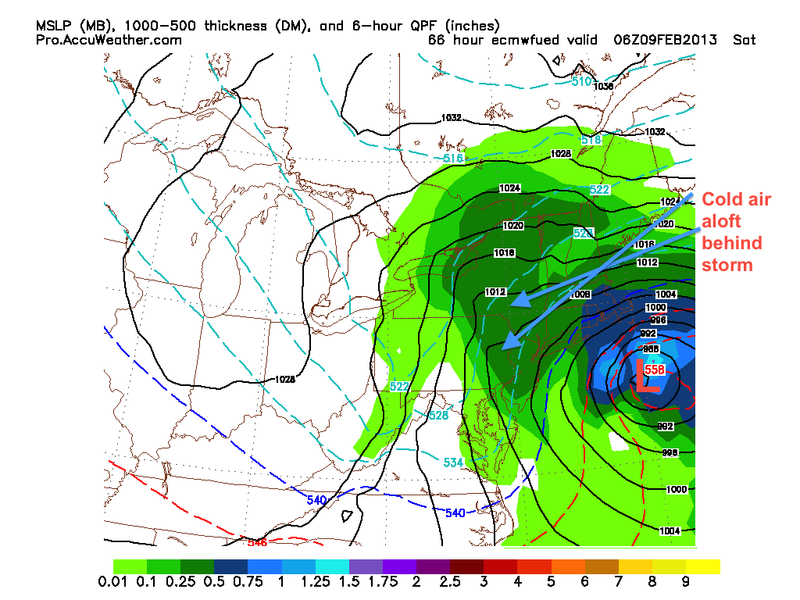 Without a doubt, this storm will be one of the strongest we’ve seen in the last 20 years. Around the Philadelphia area, precipitation should start out as rain tomorrow afternoon. By tomorrow night, snow will start to mix in from north to south. By 2 AM Saturday, heavy snow should be falling for the whole Delaware Valley. The snow should end by Saturday morning. Hey everyone. The lack of posts for the past month have been partially my fault. College has been very time-consuming and it’s hard to find a time block to write a quality post. I am, however, taking a break from my studies to discuss the next storm coming this Friday and Saturday. This will a big one. Two fairly strong systems will phase off the coast of NJ and create a large nor’easter with blizzard conditions from NYC to Boston. For the Delaware Valley, this will be a minor storm in terms of snow. The phase is occurring way too late and there will not enough cold air aloft for snow to fall. 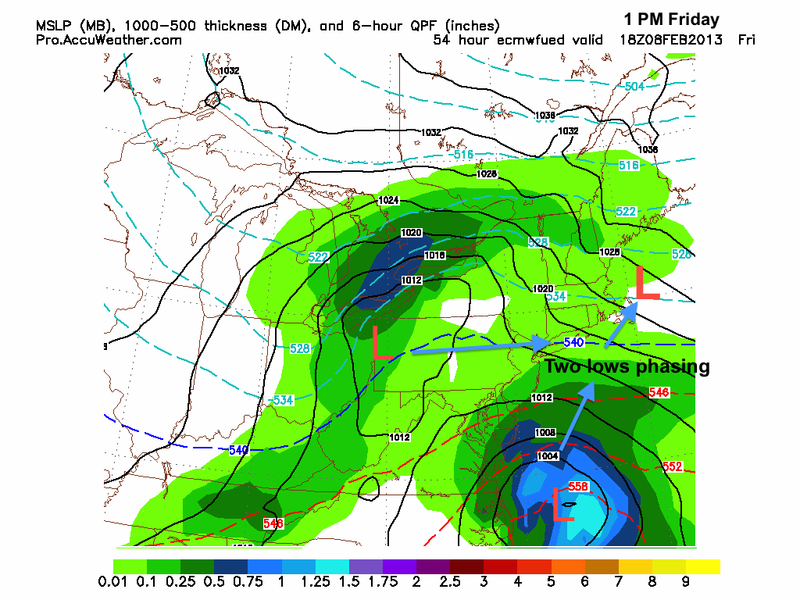 The graphic below shows the European solution at 1 PM Friday. This is right before the storms phase. As you can see, not enough cold air is available to support snow for the area (represented by the blue 540 line). As the low pressures phase and strengthen, cold air aloft will eventually get wrapped around the storm. This will help change the rain to snow from north to south in the Delaware Valley, while creating blizzard conditions in New England. The crucial component of this storm will be the timing of the phase. The slower the phase, the less snow for places south and west. If the phase occurs quicker than expected, then the changeover to snow could occur much sooner than the European model is showing above.